During his address to the joint sitting of the Parliament, President Ram Nath Kovind pitches for simultaneous elections. Multiple elections are conducted each year by the Election Commission of India (EC) to various positions in Local bodies, State government and Central government. The Model Code of Conduct (MCC), a set of guidelines issued by the EC to regulate the conduct of political parties and their candidates in the run-up to every election, is aimed at ensuring free and fair elections and preventing the party in power from gaining an unfair advantage utilising state machinery. Among other clauses, it places severe restrictions on announcements of new development projects and policies, awarding of grants, government job appointments etc. Though not legally binding, it is in the EC’s discretion to disqualify candidates who violate the MCC. The solution to India’s chronic underdevelopment may perhaps lie in the panacea of holding one mega election every five years. The President declared: "Citizens alive (sic) to the state of governance in the country are concerned about the frequent elections... which adversely impact the economy”. Many developed nations, including United States, United Kingdom, Canada, Germany, Norway, Switzerland, Australia and even the European Parliament hold fixed or semi-fixed elections. Simultaneous elections in India were held in the years 1951-52, 1957, 1962 and 1967. The cycle was disrupted due to premature dissolution of Assemblies and Lok Sabhas due to various reasons. A Standing Committee, appointed by the previous UPA government to study the feasibility of simultaneous elections in India, in its report stated that not having to hold frequent elections was “important for India… to compete with other nations in developmental agenda”. The contention is that with multiple elections, the Model Code of Conduct is in force for much of the time, which prevents the government from initiating new projects and ultimately slows down development work. There is a loss of productivity for citizens as well as to the government due to the various rallies and campaigning that takes place during the elections. Further, frequent elections (for state and Centre), hamper long-term policymaking because every decision is seen as a reason for votes; short-term measures meant to appease vote banks tend to take precedence over long-term development goals of the nation. Many have also argued that election campaigns end up sharpening fault lines of caste, religion and community across the country. If all elections are held in one particular year, and governments are formed, they can get down to good governance and need to bother about seeking the people’s mandate only after five years. 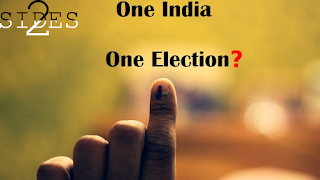 The 117th report on Reform and Electoral Laws (1999) by the Law Commission of India mentioned that holding simultaneous elections would help create more stable governments. The massive expenditure, incurred to hold elections in India would be vastly reduced by conducting them simultaneously. It is estimated that the 2014 Lok Sabha polls alone cost the exchequer Rs 3,500 crores, excluding the expenses incurred for security and individual political parties, and the various political parties incurred a whopping Rs 30,000 crore for the same. In comparison, the Election Commission of India has estimated the cost of holding simultaneous elections to the Lok Sabha and State Assemblies together, to Rs 4,500 crore. India is a federal republic with a vertical division of powers between the Centre and the states. Elections held separately for the State Assemblies and the Lok Sabha help voters better express their voting choices for the two different governments which would be elected by exercising of their franchise. This distinction gets blurred when voters are made to vote for electing two types of government at the same time, at the same polling booth, and on the same day. 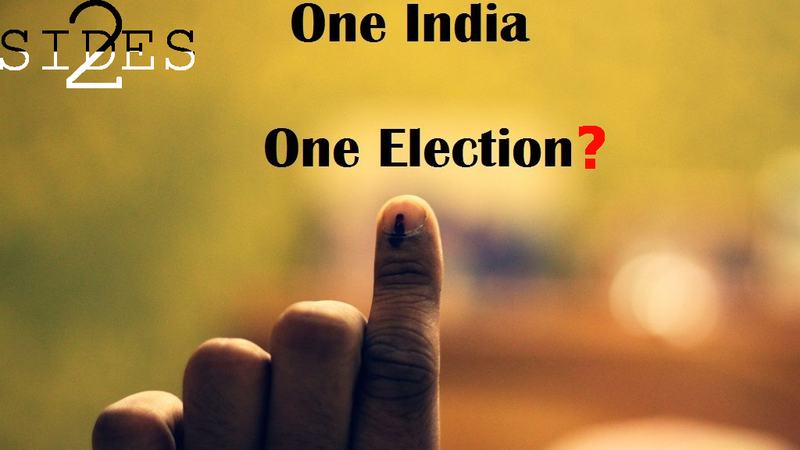 Studies have shown that voters tend to vote for the same party for both the State as well as the Central government in case of elections held simultaneously; whereas, no such correlation exists in case of separate elections for the same. Assembly elections are fought on local issues and, in the true spirit of federalism, parties and leaders are judged in the context of their work done in the state. Frequent elections bring the politicians back to the voters, create jobs and prevent the mixing of local and national issues in the minds of the voters. Clubbing them with the general election could lead to a situation where the national narrative submerges the regional story. Smaller players like the Aam Aadmi Party, the Trinamool Congress and the Communist Party of India (Marxist) will get noised out in the din of general elections. Reduced diversity in elected governments will lead to greater centralisation of power. Logistical hurdles also have to be considered to conduct simultaneous elections throughout the world's biggest democracy. Currently, there is a dearth of enough security and administrative officials to conduct simultaneous elections throughout the country. In fact, recent elections in West Bengal were held in 6 phases mainly due to the security concerns. However, the biggest challenge to simultaneous polls lies in getting the party political consensus needed to bring an amendment in the law. To transform it into reality, Modi will have to rewrite some of the basic principles of our Constitution. The bigger threat to the federal structure, however, is that the phenomenon of governments failing to complete their term is quite common in our country. Since there cannot be a re-election, such states where a government fell would be ruled by the Centre until the next elections. This also means five years of President’s Rule for states that do not deliver a clear mandate in the elections. Thus the once-in-five-years election rule will enhance the political incentive for the Centre to dismiss duly elected state governments since the constitutional obligation to hold elections within six months of dismissal will no longer exist. In short, simultaneous elections hold potential to turn India into an authoritarian state, with the mere appearance of a federal democracy.